Since the introduction of the 12-Lead EKG to EMS in the late 90’s has there been a more important piece of equipment then capnography? Your cardiac monitor with capnography capability has all the tools you need to find out the patient’s problem, determine a course of treatment and more importantly determine if that treatment is working. Just like teaching 12-Leads, teaching the finer points of capnography can be a challenge. As an instructor you need to develop content and prepare to be creative, dynamic and fluid in your teaching style for students to gain an understanding and working knowledge of this powerful tool. The secret to creating a positive learning environment is preparation. In EMS education, preparation is too often grossly ignored and pushed aside. Standing in front of a class and reading from a PowerPoint slide deck, with your back to the class, is a failure on many levels. Be the instructor you would want to teach you. Is always prepared and practices. Spend as much as three hours of prep and practice for every hour of instruction. Considers their class to be a performance. Be dynamic, energetic and use your presentation skills as a prop to deliver an awesome program. Always watches the audience, makes eye contact and assesses whether the students are connecting with the material. Develops and uses multiple examples to teach the same point to the different types of adult learners in the class. A Field Training Officer (FTO) is just as accountable as an instructor that delivers initial paramedic education or a training officer teaching refresher courses. Even though an FTO’s classroom is the ambulance, a patient’s residence or a hospital emergency room an FTO needs to deliver with the same energy. Master reading of a normal capnogram waveform. Throughout the training, use as many waveform examples with matching patient scenarios as possible. It is best to outline the patient’s presentation, condition, vital signs and history before introducing the waveform and 12-Lead. This will assist the student in developing a relationship between the patient’s presentation and what to expect from the diagnostic findings. Test students’ knowledge retention by asking them to draw and label a waveform as you present the four phases of inhalation and exhalation. See if students comprehend by capnography giving them a patient presentation, such as asthma or sepsis, and having them draw the anticipated waveform. 1. Hypoventilation which is related to a decreased respiratory rate and will display fewer waveforms per minute. Each waveform has an increased height. 3. Bronchospastic waveforms are identified by the shark-fin shape instead of the rounder-box waveform. Bronchospasms cause a slower, more variable release of CO2 from the alveoli which results in a slower rise in the expiratory upstroke. Throughout training emphasize the importance of this powerful tool. From the very beginning students need to understand capnography is the standard of care for every patient. 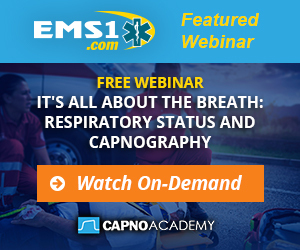 Mastering the use and interpretation of capnography takes a combination of knowledge, skill, and experience, and changes the game in patient treatment and management.